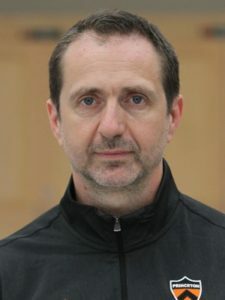 Oleg Stetsiv, who has enjoyed a long run of sending talented fencers on to NCAA success during his club coaching career, joined the Princeton coaching staff as the program’s saber coach in 2016. In 2016-17, Stetsiv’s saber corps earned two All-Ivy League honors and picked up the maximum four NCAA finals berths, leading to two All-America honors and an NCAA semifinals berth for rookie Maia Chamberlain. Stetsiv coached at the Bergen Fencing Club with his father Orest and son Andrew. Among those under his tutelage at Bergen, Francesca Russo went on to win an NCAA saber title at Notre Dame in 2015, and Caroline Vloka was the NCAA saber champion in 2010 at Harvard. Stetsiv has tutored Tiger fencers before and during their Princeton careers, including North Jersey native Allison Lee from the Class of 2018, who earned All-America honors as a freshman, and Sage Palmedo from the Class of 2019, with whom Stetsiv worked when she arrived at Princeton and who earned first-team All-Ivy honors during her rookie year. Palmedo went on to medal at the Junior World Championships. As a competitor, Stetsiv is an “A”-rated fencer who earned national championships in Ukraine in cadet, junior and senior competitions, and in the U.S., Stetsiv has coached fencers on senior national teams including Princeton’s own Eliza Stone ’13 and Rutgers alum Ben Igoe, who finished third at the Grand Prix in Budapest. Stetsiv has been chosen three times as the women’s national coach for the Cadet and Junior World Championships. He has also worked as a referee, officiating events both in the U.S. and abroad.